Royal, court or cathedral the length of your train can help set the mood for your entire event. 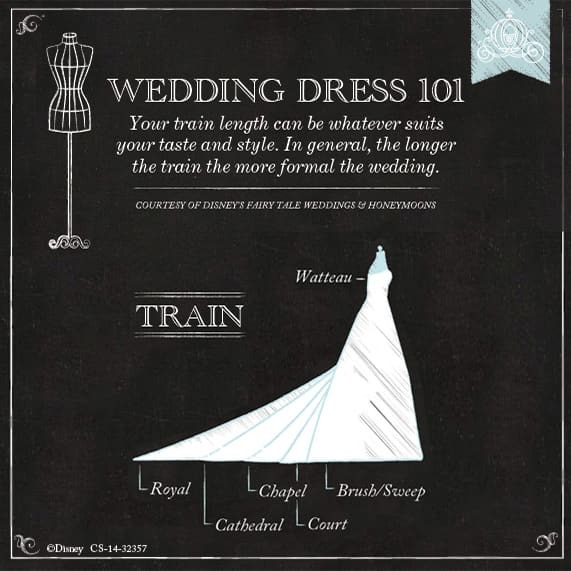 As a general rule of thumb, the longer the train of the wedding dress the more formal the event. My advice? Consider your venue, activities and guests- if you're looking to dance the night away, be sure to bring some cha cha shoes and opt for a dress that easily bustles or doesn't have a train at all. Of course there's nothing I love more than a good outfit change, so consider two wedding gowns if you're looking to achieve a more formal look for your ceremony and a casual, elegant look for the reception.